LAS CRUCES, N.M. - The New Mexico State baseball team opened a three-game weekend series against Western Athletic Conference foe Grand Canyon on Friday night at Presley Askew Field. After tying the game up in the fifth, the Aggies lost the lead in the next frame and could not mount a late comeback falling to the Lopes in the series opener, 7-4. DENVER, CO - New Mexico State men’s tennis sophomore Louis Menard was named the Western Athletic Conference Singles Player of the Week after a strong outing on the courts last week. This is the second weekly honor for Menard this season and fourth overall for NM State since the start of dual action. The Annecy, France, product became the first Aggie to reach the 20-win plateau this past weekend after pushing his win-streak to six-straight. Menard currently sits at 21-10 overall in singles play and 12-6 in dual action for New Mexico State while also winning eight of his last 10 matches. Menard and the Aggies sit in a tie for first in the league standings with Grand Canyon after going 3-0 on the weekend at home. 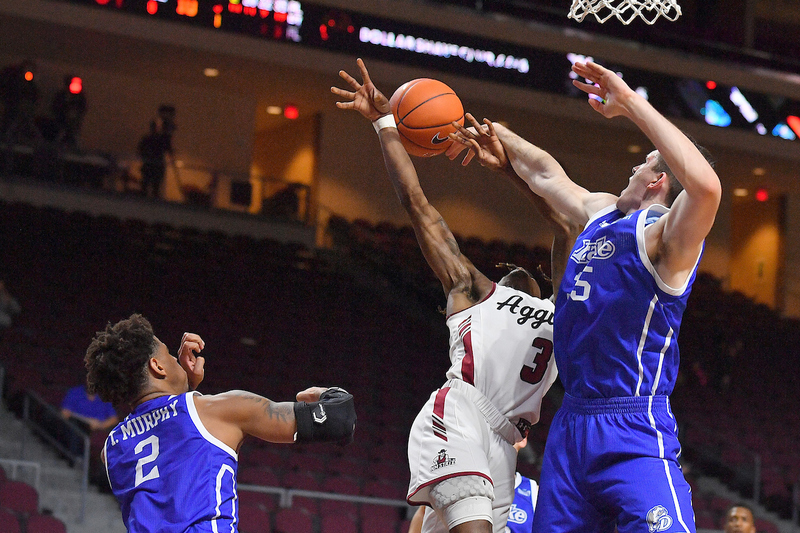 NM State will get this week off before hosting NMMI in a doubleheader with the women’s team on Tuesday, April 9, at 2 p.m. (MT). Both the men’s and women’s teams will be honoring their seniors. DENVER, CO - New Mexico State men’s tennis senior Stijn de Haan was named the Western Athletic Conference Singles Player of the Week after leading to the Aggies to a thrilling 4-3 win over Southern Miss this past Sunday. This the first weekly honor for de Haan in the spring and second once you include the player of the month honor back in September. As a team, this is just the third singles player of the week honor for NM State. In his lone match this past Sunday, de Haan made quick work of Tom Cecchetto for NM State’s first point of the match 6-1, 6-2 at the top singles position. 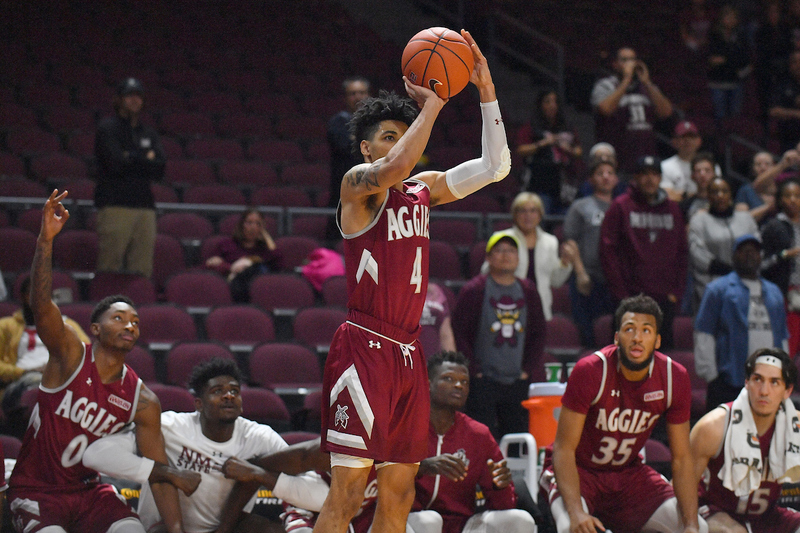 NM State and de Haan are set to wrap up their southern swing today at Nicholls State before returning home to host the first WAC pod beginning Friday, March 29. DENVER, CO - NM State’s Tristan Peterson has been named Western Athletic Conference Hitter of the Week for March 18 – March 24. Peterson, a junior infielder from Tucson, Ariz. (Canyon del Oro HS/Howard JC), was the top hitter in the WAC during the opening weekend of conference play in a series win against CSU Bakersfield and chipped in a solid non-conference game at Arizona as well. On the week, he was 12-of-19 from the plate with 13 RBIs, five home runs and seven runs scored. All five home runs and 10 of those RBIs came in a three-game series against CSU Bakersfield as the transfer helped the Aggies outscore the ‘Runners, 44-14. Through the first three games of WAC play, he is hitting .643 with a 1.786 slugging percentage. CORNVILLE, AZ - The New Mexico State women’s golf team completed play at the two-day, three-round Red Rocks Invitational on Sunday at the Agave Highland Golf Club. After sitting in a tie for fourth at the start of the day, the Aggies fired a tournament-best 278 (-6) for a final team score of 853 (+1) that saw the team take home the Red Rocks Invite championship, the second team title of the season for the Crimson & White. AMES, IA - The New Mexico State women’s basketball team bowed out of the first round of the NCAA Tournament with a 97-61 loss against third-seeded Iowa State at Hilton Coliseum on Saturday night. CHRIS JANS: Heck of a college basketball game. That is what March Madness is all about. Really proud of our guys. I think a lot of teams would have packed and went home when it got bleak for a while. We kept trying to whittle it back and we gave ourselves a chance. We gave ourselves a chance, in the end to come from behind and get a win in the tournament. Unfortunately, we didn't. Q. I want to know, did you know you were down by two and based on that, you know, talk about your decision to kick it out for the win, I guess? AJ HARRIS: I seen the points, we were down two, so I felt like Terrell Brown was open, he got a great shot off, got fouled. I was trusting my teammate, my partner. Q. Did you think you had an open shot? For us, it looked like you were open. I don't know.